Something a bit different…knife sheath! A friend at work brought in this behemoth of a blade, a Busse prototype Bowie, and asked about a sheath for it. Formidable in size with a 5/16″ thick, 10″ long dual curve blade it made for a fun diversion from my standard offerings. 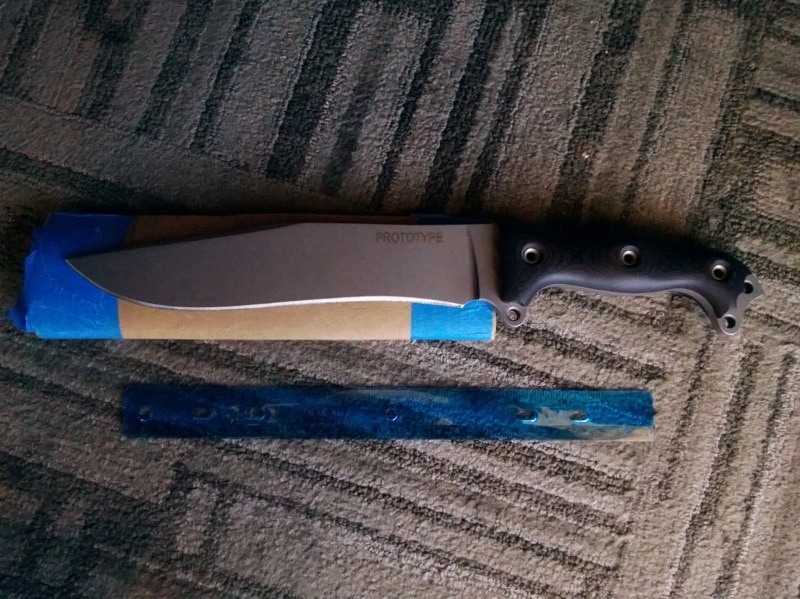 I decided on a hybrid of a standard folded sheath with a 3/4 welted and stitched design to best fit the thickness of the blade while showing off the curves at the same time. Made from 6oz drum dyed (dyed all the way through) Black cowhide with black stitching and a nickel Sam Browne button for the cross over closure. The belt loop extends all the way up so the handle rests just below the belt line to allow for easier access and full withdrawal without tilting the sheath. Had such a good time making this one, custom knife sheathes are being added to the product line for anyone interested. Black, brown, custom colors, etc. will all be available upon request. Keychain & wallet chain belt straps now available! I finally finished getting all the parts, the design and samples made for the new belt straps. Two different versions with a number of options are available in the Etsy shop for immediate purchase. These belt loops are made from a single piece of thick 6 oz Herman Oak leather and drum dyed all the way through in either black or brown. You can choose from a keychain ring or a large claw clasp to keep your gear close at hand. There are currently 12 decorative snap heads to choose from including military, Harley Davidson half skull and others. 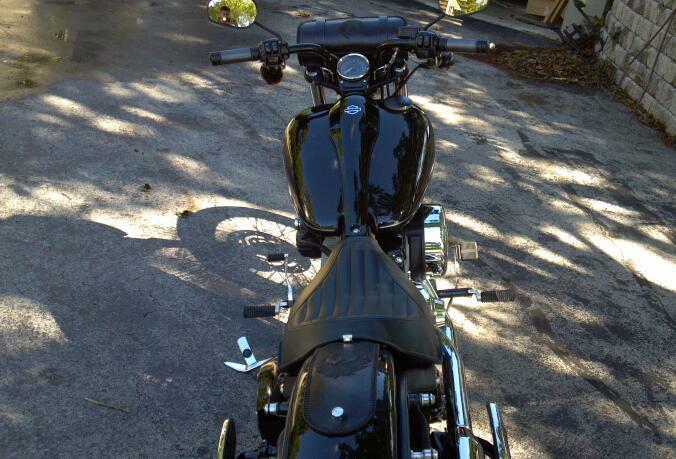 I also have a couples of overstock rear fender bibs in the shop ready to ship and will be adding more soon. 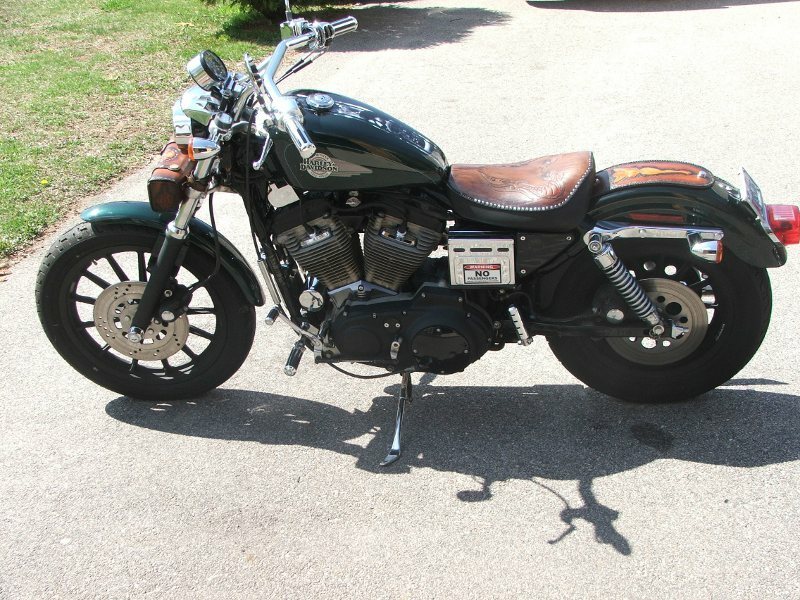 With winter ending and the 2013 riding season starting with a roar, this edition features a sweet Sportster just perfect for cruisin’ the warm summer months. While I didn’t do all of the leather for Tony’s 1996 883 (I did the pin-up rear fender bib), it all comes together along with some little extras he had custom made. Had a fun project this last week that I thought would be cool to share some of the work in progress pics. Tony hit me up last month looking for a rear fender bib for his 1996 Harley Davidson Sportster featuring a Jessica Rabbit style pin-up wearing quite a bit less than we saw her in the movie. He sent a few pics along with a shot of his existing handlebar bag so I could match the color and background style of the bag. The following is a sequence from pattern to finished piece and a few steps in between. I’m actually thinking that next month when the shop is closed for Babycation I may go back and do another one and take a few more pictures of the process including the dying/airbrushing stages to “flesh” those out a bit more for you.